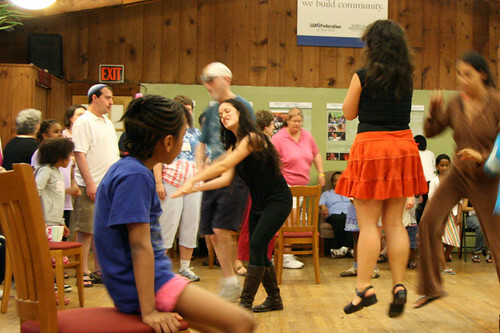 I just returned from the residency I did for the Jewish Multiracial Network, located at Isabella Freedman Jewish Retreat Center. As part of my programming I worked with the youth staff to generate a series of questions regarding Jewish Identity. These questions then set the framework for the theater games (inspired by theater of the oppressed) and the flag books that we made over the course of the weekend. What do you need from society, yourself, the Jewish Community to recognize diversity and to become aware of racism, sexism, homophobia (oppression) both internalized and experienced and the times you yourself have been racist, sexist , homophobic, and then move past to create change? What do you do when you are in an uncomfortable situation regarding your Judaism? Do you have a Non-Jewish side, what is that like? What makes a person culturally Jewish? What make you a Jew in your everyday life? Define what makes someone Jewish. Name your greatest Jewish moment. Did you ever not feel Jewish? What is it about being Jewish that makes you most proud? What do you love about being Jewish? What was your weirdest Jewish Experience? Have you ever questioned your Jewish Identity? Has anyone else ever questioned your Jewish Identity? Have you ever questioned another persons Jewish Identity? What symbols represent Judaism for you? What non-Jewish activities do you partake in that to you are “Very Jewish”? What is your responsibility as a Jew of color? What is your responsibility as a Jew? The following is my answer to the penultimate question on the survey. (a) be unwavering in our adherence to Judaism, whatever our observance level Even when this may cause conflicts among our latino friends/family. That said, when we say “no I can’t do this or that” we have to be delicate in our approach so we don’t turn people off. (b) Stand up for our fellow Jews if we perceive a slight by one of our compadres, and likewise, if we hear an insensitive or stereotypical remark about nuestra gente latina, we have to politely but confidently set the record straight. (c) Finally, in a general sense we are both insiders and outsiders in BOTH communities. For many Jews, we may be the only Latinos they interact with and we have to be a positive example, demonstrating that our Hispanic cultural background adds something to, not detracts from, our overall character traits. And for many Latinos, the same is true – the mandate to be a “light unto the nations” is especially incumbent upon us when we are dealing with our fellow Latinos – let them know that we don’t consider ourselves better than them, even if in many ways we are different. You are currently reading Jewish Identity Questions- generated by the 2008 Jewish Multiracial Network Retreat Youth Staff with Artist Maya Escobar at Maya Talk.